The RK 1 is our 'workhorse' and is respected as a standard trough. It was originally designed to fit under an epifluorescence microscope, but it is much more versatile. 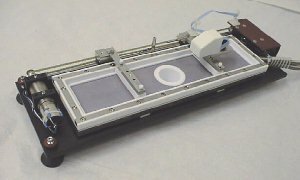 E.g., its size is compatible to the imaging ellipsometer of OPTREL. Due to the modularity, it is more than just a film balance: the trough can be easily separated form the frame that carries the mechanics for the barriers. Therefore, various troughs of different size can be used at different times with one frame. The trough is temperature isolated from the frame, which saves heating or cooling time. Standard: area = 160 cm2, circular dipping well in center (diameter: 2cm, depth: 2cm), depth of trough = 3 mm. Two compartment: as Standard, but without dipping well; instead, at the center a triangular barrier is formed to seperate the subphase into two compartments. Bio: area = 60 cm2, comes with seperate set of barriers and additional subphase seperators. Special construction allows in situ exchange of subphase. Full analog electronics, modular, precise, and easy to handle. Large trough system for LB deposition.Two synchroneously moving barriers, A=1200 cm2 , dipping well 100 mm diameter and 100 mm depth. Various designs for x-ray reflectivity measurements at the air-water interface have been developed; all of them were made according to customer specifications. An example can be seen here. A special trough was designed to fit into the FTIR spectrometer of Bruker Analytik GmbH. Ask for more information. We deliver the trough that fits for the Multiskop of Optrel GmbH .